Area: 32,547 square kilometers (12,566 sq. mi. ), about the size of Maryland. Cities: Capital: Brussels (pop. 1,089,538). Other cities — Antwerp (483,505); Ghent (243,336); Charleroi (202,598); Liege (192, 504); Bruges (116,741); and Namur (108,950). Annual population growth rate (2011): -0.04%. Density: 830.1 per sq. mi. Religions: Predominantly Roman Catholic, with Protestant, Jewish, Muslim, Anglican, Greek and Russian Orthodox, as well as secularism, "recognized" religions receiving government subsidies. Languages: Dutch, French, German. Linguistic regions — (Dutch-speaking) Flanders 57.7%; (French-speaking) Wallonia 31.6%; (legally bilingual) Brussels Capital Region 10%; German-speaking 0.7%. Branches: Executive: King (head of state), Prime Minister (head of government), Council of Ministers (cabinet). Legislative — bicameral parliament (Senate and House of Representatives). Major political parties: Christian Democratic, Liberal, Socialist, Green, Flemish nationalists (New Flemish Alliance), Flemish far right (Vlaams Belang). Political subdivisions: Ten provinces, three regions, three communities, 589 municipalities. GDP (purchasing power parity, 2011 est. ): €352 billion (approx. $467 billion). Annual real growth rate (2011 est. ): 2.5%. Per capita income (PPP, 2010 est. ): €35,238 (approx. $48,535). Agriculture: (1% of GDP) Products: livestock, including dairy cattle, grain, sugarbeets, milk, tobacco, potatoes, and other fruits and vegetables. Industry: (24.3% of GDP) Types: engineering and metal products, motor vehicle assembly, transportation equipment, scientific instruments, processed food and beverages, chemicals, basic metals, textiles, glass, petroleum. Trade: Exports (2011 est. ): $263.7 billion: transportation equipment, diamonds, metals and metal products, foodstuffs, chemicals. Export partners — Germany 19.6%, France 17.7%, Netherlands 11.8%, U.K. 7.2%, U.S. 5.4%, Italy 4.7%. Imports (2010 est.) — $261 billion: machinery and equipment, chemicals, diamonds, foodstuffs, pharmaceuticals, transportation equipment, oil products. Import partners (2010 est.) — Netherlands 17.9%, Germany 17.1%, France 11.7%, Ireland 6.3%, U.S. 5.7%, U.K. 5.1%, China 4.1%. 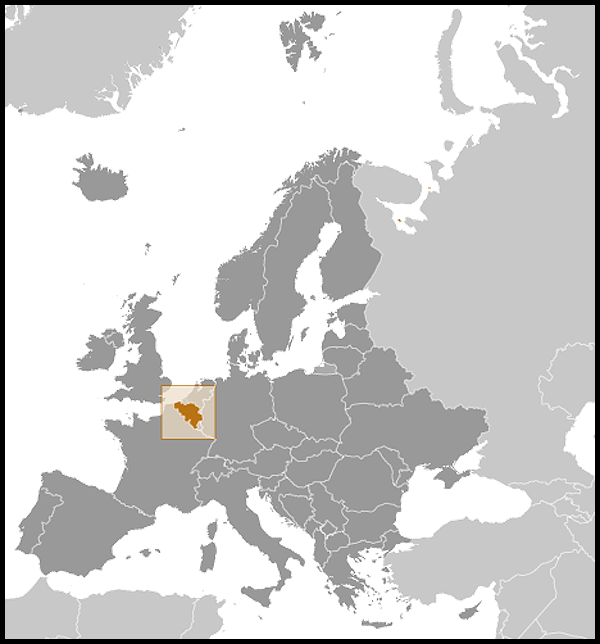 Belgium is located in Western Europe, bordered by the Netherlands, Germany, Luxembourg, France, and the North Sea. Although generally flat, the terrain becomes increasingly hilly and forested in the southeast (Ardennes) region. Climate is cool, temperate, and rainy; summer temperatures average 77°F, winters average 45°F. Annual extremes (rarely attained) are 10°F and 100°F. 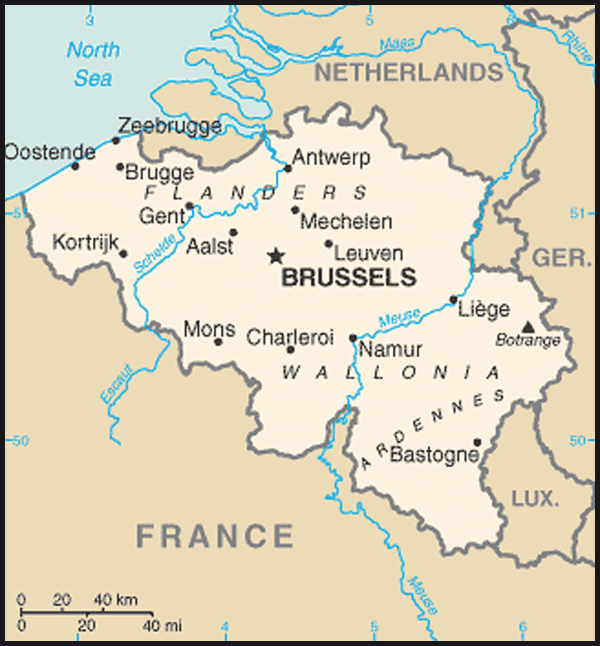 Belgium derives its name from the Belgae, a Celtic tribe. The Belgae were forced to yield to Roman legions during the first century B.C. For some 300 years thereafter, what is now Belgium flourished as a province of Rome. But Rome's power gradually lessened. In about A.D. 300, Attila the Hun invaded what is now Germany and pushed Germanic tribes into northern Belgium. About 100 years later, the Germanic tribe of the Franks invaded and took possession of Belgium. The northern part of present-day Belgium became an overwhelmingly Germanized and Germanic-Frankish-speaking area, whereas in the southern part people continued to be Roman and spoke derivatives of Latin. After coming under the rule of the Dukes of Burgundy and, through marriage, passing into the possession of the Hapsburgs, Belgium was occupied by the Spanish (1519-1713) and the Austrians (1713-1794). Under these various rulers, and especially during the 500 years from the 12th to the 17th century, the great cities of Ghent, Bruges, Brussels, and Antwerp took turns at being major European centers for commerce, industry (especially textiles), and art. Flemish painting — from Van Eyck and Breugel to Rubens and Van Dyck — became the most prized in Europe. Flemish tapestries hung on castle walls throughout Europe. Following the French Revolution, Belgium was invaded and annexed by Napoleonic France in 1795. Following the defeat of Napoleon's army at the Battle of Waterloo, fought just a few miles south of Brussels, Belgium was separated from France and made part of the Netherlands by the Congress of Vienna in 1815. In 1830, Belgium won its independence from the Dutch as a result of an uprising of the Belgian people. A constitutional monarchy was established in 1831, with a monarch invited in from the House of Saxe-Coburg Gotha in Germany. Belgium was invaded by Germany in 1914 and again in 1940. Those invasions, plus disillusionment over postwar Soviet behavior, made Belgium one of the foremost advocates of collective security within the framework of European integration and the Atlantic partnership. Since 1944, when British, Canadian, and American armies liberated Belgium, the country has lived in security and at a level of increased well-being. Language, economic, and political differences between Dutch-speaking Flanders and Francophone Wallonia have led to increased divisions in Belgian society. The Industrial Revolution of the late 18th and the 19th century accentuated the linguistic North-South division. Francophone Wallonia became an early industrial boom area, affluent and politically dominant. Dutch-speaking Flanders remained agricultural and was economically and politically outdistanced by Brussels and Wallonia. The last 50 years have marked the rapid economic development of Flanders while the coal and steel industries of Wallonia went into sharp decline, resulting in a corresponding shift of political and economic power to the Flemish, who now constitute an absolute majority (58%) of the population. Demonstrations in the early 1960s led to the establishment of a formal linguistic border in 1962, and elaborate rules made to protect minorities in linguistically mixed border areas. In 1970, Flemish and Francophone cultural councils were established with authority in matters of language and culture for the two-language groups. Each of the three economic regions — Flanders, Wallonia, and Brussels — was granted a significant measure of political autonomy. Since 1984, the German language community of Belgium (in the eastern part of Liege Province) has had its own legislative assembly and executive, which have authority in cultural, language, and subsequently educational affairs. In 1988-89, the Constitution was again amended to give additional responsibilities to the regions and communities. The most sweeping change was the devolution of educational responsibilities to the community level. As a result, the regions and communities were provided additional revenue, and Brussels was given its own legislative assembly and executive. Another important constitutional reform occurred in the summer of 1993, changing Belgium from a unitary to a federal state. It also reformed the bicameral parliamentary system and provided for the direct election of the members of community and regional legislative councils. The bilingual Brabant province, which contained the Brussels region, was split into separate Flemish and Walloon Brabant provinces. The revised Constitution came into force in 1994. As a parliamentary democracy, Belgium has been governed by successive coalitions of two or more political parties. The centrist Christian Democratic Party often provided the Prime Minister. In the 1999 general election, Belgian voters rejected Jean Luc Dehaene's longstanding coalition government of Christian Democrats and Socialists and voted into power a coalition led by Flemish Liberal Leader Guy Verhofstadt. The first Verhofstadt government (1999-2003) was a six-party coalition between the Flemish and Francophone Liberals, Socialists, and Greens. It was the first Liberal-led coalition in generations and the first six-party coalition in 20 years. It also was the first time the Greens had participated in Belgium's federal government. In the general election of 2003, the Greens suffered significant losses, while the Socialists posted strong gains and the Liberals also had modest growth in electoral support. Liberal Prime Minister Guy Verhofstadt reconstituted the coalition as a four-party government in July 2003, with only the Liberals and Socialists in power. In the 2007 general elections, the Flemish Christian Democratic CD&V recouped the lost ground, becoming the country's largest party. The two Socialist parties and Prime Minister Guy Verhofstadt's Open VLD lost support. The Francophone Liberal MR became the largest party of Wallonia and Brussels. Following the election, the King tasked CD&V leader Yves Leterme with forming a new government. The ruling coalition was composed of Flemish Christian Democrats (CD&V), Francophone Christian Democrats (CDH), Flemish Liberals (Open VLD), Francophone Liberals (MR), and the Francophone Socialists (PS). However, it took over 9 months to form a government, which remained subject to intense strains. Leterme stepped down in December 2008 and was replaced as Prime Minister and head of the same coalition by the CD&V's Herman Van Rompuy. Van Rompuy's appointment as President of the European Council under the Treaty of Lisbon paved the way for Leterme to regain his position as Prime Minister in November 2009. However, an electoral dispute between the Francophone and Flemish parties continually plagued his government coalition, which finally collapsed in April 2010. The Francophone Socialist (PS) and Flemish nationalist (New Flemish Alliance — N-VA) parties won the largest proportion of seats during parliamentary elections in June 2010. The N-VA became the largest party in the House of Representatives, winning 27 seats compared to 4 in 2007, indicating growing support for regional autonomy in Flanders. Throughout 2011, no governing coalition was formed due to continued inability of the Francophone and Flemish parties to reach a compromise over state reforms. Prime Minister Leterme and his cabinet remained in office in a caretaker capacity. In September 2011, the six negotiating parties achieved a breakthrough agreement on local government of an electoral district with a Francophone majority comprising both Brussels and parts of the surrounding Flemish region. The agreement was finalized in October, with only the remaining hurdle of budget allocation among Belgium's local regions. However, in early November the government announced that due to slowed economic growth, further austerity measures would be necessary, which would delay government formation. As of November 2011, a new government was expected by the end of the calendar year. The Belgian Parliament consists of a Senate and a House of Representatives. The House of Representatives has 150 directly elected members. The Senate has 71 members. The executive branch of the government consists of ministers and secretaries of state (junior ministers) drawn from the political parties that form the government coalition. The number of ministers is limited to 15, and they have no seat in Parliament. The Council of Ministers is chaired by the Prime Minister and consists of the ministerial heads of the executive departments. The allocation of powers between the Parliament and the Council of Ministers is somewhat similar to the United States — the Parliament enacts legislation and appropriates funds — but the Belgian Parliament does not have the same degree of independent power that the U.S. Congress has. Members of political parties represented in the government are expected to support all bills presented by the Cabinet. The House of Representatives is the "political" body that votes on motions of confidence and budgets. The Senate deals with long-term issues and votes on an equal footing with the Chamber on a limited range of matters, including constitutional reform bills and international treaties. The parties in the current House are the New Flemish Alliance (N-VA) 27 seats; Francophone Socialists (PS) 26 seats; Francophone Liberals (MR) 18 seats; Christian Democrats (CD&V) 17 seats; Flemish Liberals (Open VLD) 13 seats; Flemish Socialists (SP.A) 13 seats; Flemish Interest (VB) 12 seats; Francophone Democratic and Humanist Center (CDH) 9 seats; Francophone Greens (Ecolo) 8 seats; Flemish Greens (Groen!) 5 seats; List Dedecker 1 seat; Francophone People's Party (PP) 1 seat. At the federal level, executive power is wielded by the Council of Ministers. The Prime Minister chairs the Council. Each minister heads a governmental department. No single party or party "family" across linguistic lines holds an absolute majority of seats in Parliament. Consequently, the Council of Ministers reflects the weight of political parties that constitute the governing coalition in the House. Note: Belgium's current government serves as a caretaker until a new government coalition forms following the June 2010 elections. The Belgian embassy (http://www.diplobel.us/) is located at 3330 Garfield Street NW, Washington, DC 20008 (tel. 202-333-6900; fax 202-333-3079). The number of seats in the House of Representatives is constitutionally set at 150, elected from 11 electoral districts. Each district is given a number of seats proportional to its total population (not number of eligible voters) ranging from 4 for the Luxembourg district to 24 for Antwerp. The districts are divided along linguistic lines: 5 Flemish, 5 Walloon, and the bilingual district of Brussels-Halle-Vilvoorde. The Senate consists of 71 seats. For electoral purposes, Senators are divided into three categories: 40 directly elected; 21 elected by the community parliaments; and 10 "co-opted" Senators. For the election of the 25 Flemish and 15 Francophone directly elected Senators, the country is divided into three electoral districts — Flanders, Wallonia, and the Brussels Capital Region. Of the 21 Senators representing the communities, 10 are elected by the Flemish Parliament, 10 by the French Community Parliament, and 1 by the German-language Parliament. The remaining category, the 10 "co-opted" senators, are elected by the first two groups of senators. The princes and princesses of the royal line are also members of the Senate — currently Prince Philippe, Prince Laurent, and Princess Astrid. In Belgium, there are no "national" parties operating on both sides of the linguistic border. Consequently, elections are a contest among Flemish parties in Dutch-speaking Flanders and Francophone parties in Wallonia. Only in officially bilingual Brussels can voters choose from either Flemish or Francophone parties. Several months before an election, the parties form a list of candidates for each district. Parties are allowed to place as many candidates on their "list" as there are seats available. The formation of the list is an internal process that varies with each party. The number of seats each party receives and where on a list a candidate is placed, or how many individual votes a candidate receives, determines whether a candidate is elected. Since no single party holds an absolute majority in Parliament, after each election the strongest party or "party family" will create a coalition with other parties to form the government. Voting is compulsory in Belgium; more than 90% of eligible voters participate. Belgium has 22 seats in the European Parliament. Of total public spending — interest payments not considered — more than 40% is authorized by the regions and communities. The provincial governments are primarily administrative units and are politically weak. A governor appointed by the King presides over each province. Each governor is supported by an elected Provincial Council of 47 to 84 members (depending on the size of the province), which sits only 4 weeks a year. The Christian Democratic Parties. After World War II, the Catholic (subsequently Christian Democratic) Party severed its formal ties with the Church. It became a mass party of the center (more like a political party in the United States). In 1968, the Christian Democratic Party responded to linguistic tensions in the country by dividing into two independent parties, now known as the Democratic and Humanist Center (CDH) in Francophone Wallonia and the Flemish Christian Democrats (CD&V) in Flanders. The two parties share similar policies, but not on institutional issues. The CD&V is the country's largest party, while the CDH is among the smaller parties. The Socialist Parties. The modern Belgian Socialist parties are labor- and city-based parties. Despite the post-World War II dominance of the Christian Democrats, the Socialists headed several postwar governments. The Socialists also split along linguistic lines in 1978. The Francophone Socialists dominate the cities and towns of Wallonia's industrial basin. The Flemish Socialists' support is less concentrated. The Liberal Parties. In modern times, the Liberal Parties in Belgium have chiefly appealed to business people, property owners, shopkeepers, and the self-employed. In American terms, the Liberals' positions could be considered to reflect a more conservative free market oriented economic ideology. This non-interventionist ideology is reflected also in the parties' strong support for gay marriage, homosexual adoption, and euthanasia. The two current Liberal parties were formed in 1971, after the original all-Belgium Liberal Party split along linguistic lines. They are the Flemish Liberals and Democrats (Open VLD) in Flanders and the Reform Movement (MR) in Wallonia. Greens. The Flemish (Groen!) and Francophone (ECOLO) ecologist parties made their parliamentary breakthrough in 1981. Following significant gains in the 1999 general elections, the two Green parties joined a federal coalition cabinet for the first time in their history in Prime Minister Verhofstadt's first six-party coalition government. The parties experienced significant losses in the May 2003 election, however, with ECOLO winning only four seats in the Chamber and AGALEV failing to win any seats. They were thus excluded from the new coalition formed by returning Liberal Prime Minister Verhofstadt in 2003. Following the election, AGALEV changed its name to "Groen!." The two parties made a slight recovery in the 2007 general elections and did even better in the 2010 general elections. The far-right Vlaams Belang (Flemish Interest) is the most militant Flemish regional party, with a separatist, anti-immigration, law and order platform. The Vlaams Belang was formerly called the Vlaams Blok, until a 2004 high court ruling confirmed a lower court verdict that the Blok was a "racist" party. Faced with further legal problems, the Blok disbanded and resurrected itself as the Vlaams Belang, with the same party leaders and basically the same radical party policy. The Vlaams Belang was the second most popular party in the 2007 general elections, with 19% of the Flemish vote. The party's support fell to 7.76% in 2010, as voters in Flanders turned to the more moderate and pragmatic New Flemish Alliance. In Brussels and Wallonia, the small far-right Front National (FN) managed to hold on to its only House seat in the 2007 general elections but lost it in the 2010 general elections. The Belgian Socialist Confederation of Labor (FGTB/ABVV). The FGTB/ABVV derives from the Socialist Trade Union Movement, established in the late 19th century in Walloon industrial areas, Brussels, and urban areas of Flanders. Today, the FGTB/ABVV is the leading union in the Hainaut, Namur, and Liege provinces and matches the CSC/ACV in Brussels. The Confederation of Liberal Labor Unions (CGSLB/ACLVB). With 240,000 members, this is the smallest of the major union groups. Drawing primarily from management positions, the Brussels-based CGLB/ACVB is Belgium's most pro-business union. 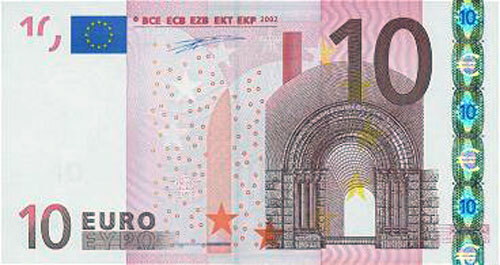 Belgium is a member of the European Economic and Monetary Union. The financial crisis, budgetary issues, the aging population, and the low employment rate remain key concerns of the government. Belgium's reaction to the September 11, 2001 terrorist attacks in the United States was strong and supportive. For example, Belgium played a key role in helping to obtain European Union (EU)-wide agreement on a European arrest warrant and in facilitating extradition of terrorist suspects. In support of Operation Enduring Freedom, Belgium contributed a navy frigate in the Mediterranean, AWAC crews for surveillance flights over the United States, as well as aircraft for humanitarian assistance to Afghanistan. Belgium has contributed troops and fighter jets to the International Security Assistance Force in Afghanistan (ISAF) since 2002 and provides humanitarian and reconstruction assistance to both Afghanistan and Iraq. In 2006, Belgium sent about 400 peacekeepers to Lebanon in support of the UN mission there. Current issues before the government include responding to the financial crisis and its severe impact on the country's banking sector, minimizing linguistic tensions between Flanders and Wallonia, dealing with the impact of immigration, improving the climate for foreign investment, dealing with rising health care costs, and adjusting the federal social security system to a rapidly aging population. Belgium continues to increase its counterterrorism capabilities by adding domestic legislative, judicial, intelligence, and law enforcement tools that increase its ability to prevent or respond to terrorism. The government also cooperates closely with other European states and the United States in investigating cases of international terrorism. Belgium operates within UN and EU frameworks concerning the freezing of terrorist assets, and in 2007 enacted a domestic legal framework to act independently. Belgium, a highly developed market economy, belongs to the Organization for Economic Cooperation and Development (OECD), a group of leading industrialized democracies. 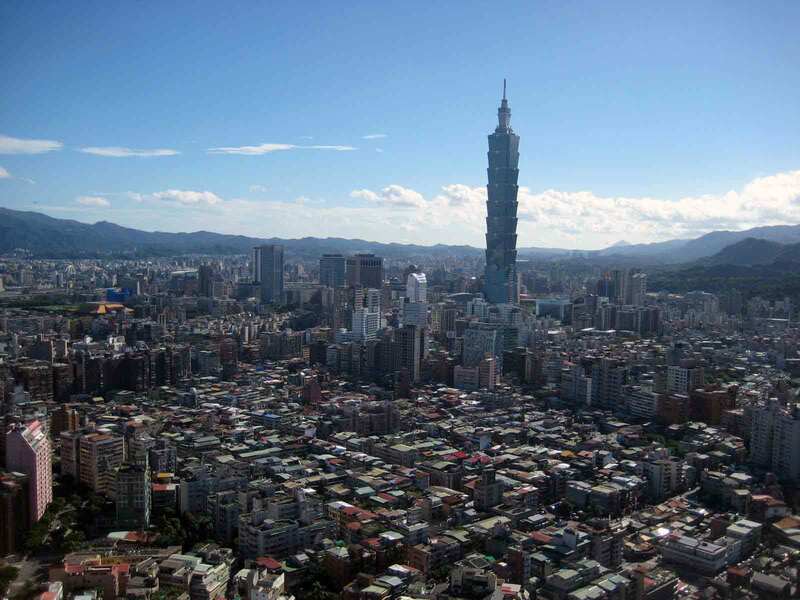 In 2011, GDP was estimated to be €352 billion (approx. $467 billion). With a geographic area about equal to that of Maryland, and a population of 10.4 million, Belgian per capita GDP ranks among the world's highest. The federal government ran large primary surpluses in recent years until 2009. Public debt remains high, at about 96.8% of GDP at the end of 2011. GDP growth in 2011 was estimated to be 2.5%. The Belgian industrial sector can be compared to a complex processing machine: It imports raw materials and semi-finished goods that are further processed and re-exported. Except for its coal, which is no longer economical to exploit, Belgium has virtually no natural resources. Nonetheless, most traditional industrial sectors are represented in the economy, including steel, textiles, refining, chemicals, food processing, pharmaceuticals, automobiles, electronics, and machinery fabrication. Despite the heavy industrial component, services account for 77.4% of GDP (2009). Agriculture accounts for only 1% of GDP. Foreign direct investment (stock) totaled more than $705 billion (cumulative) in 2009. U.S. and other foreign companies in Belgium account for approximately 11% of the total work force, with the U.S. share at about 6%. U.S. companies are heavily represented in the chemical sector, automotive assembly, petroleum refining, and pharmaceutical sectors. A number of U.S. service industries followed in the wake of these investments — banks, law firms, public relations, accounting, and executive search firms. The resident American community in Belgium now exceeds 20,000. Attracted by the EU 1992 single-market program, many U.S. law firms and lawyers have settled in Brussels since 1989. Most of Belgium's trade is with fellow EU member states. As a result, Belgium seeks to diversify and expand trade opportunities with non-EC countries. Through November 2011, Belgium ranked as the 14th-largest market for the export of U.S. goods. Bilaterally, there are few points of friction with the U.S. in the trade and economic area. The Belgian authorities are, as a rule, anti-protectionist and try to maintain a hospitable and open trade and investment climate. As a result, the U.S. Government focuses its market-opening efforts on the EU Commission and larger member states. Moreover, the Commission negotiates on trade issues for all member states, which in turn lessens bilateral trade disputes with Belgium. Belgium's unemployment rate was 7.0% in November 2011. A total of 4.47 million people make up Belgium's labor force. The majority of these people (73%) work in the service sector. Belgian industry claims 25% of the labor force and agriculture only 2%. As in other industrialized nations, pension and other social entitlement programs have become a major concern as the "baby boom" generation approaches retirement. The federal government ran a 7.1% budget deficit in 1992 at the time of the EU's Treaty of Maastricht, which established conditions for Economic and Monetary Union (EMU) that led to adoption of the common Euro currency on January 1, 2002. Among other criteria spelled out under the Maastricht treaty, the Belgian Government had to attain a budget deficit of no greater than 3% of GDP by the end of 1997; Belgium achieved this, with a total budget deficit in 2001 (just prior to implementation of the Euro currency) that amounted to 0.2% of GDP. The government had a positive primary balance between 1993 and 2007, during which time Belgium's debt to GDP level fell from 133% to just over 84%. In 2009, due to the financial and economic crisis, Belgium's deficit and debt levels increased to 6% and 96.2% of GDP respectively, with debt rising to close to 97% of GDP in 2010. Thanks to improving economic growth, Belgium's budget deficit was 4.6% in 2010 and 3.0% in 2011. According to the country's Stability Program, the deficit is planned to remain 3.0% in 2012. The Concert of Nations sanctioned the creation of Belgium in 1830 on the condition that the country would remain strictly neutral. During the two World Wars, Belgium tried but was unable to follow a policy of neutrality due to the German invasions. In 1948, Belgium signed the Treaty of Brussels with Great Britain, France, the Netherlands, and Luxembourg, and a year later became one of the founding members of NATO. Belgium supported the expansion of NATO and EU membership to the new democracies of central and eastern Europe and is actively engaged in the Organization for Security and Cooperation in Europe (OSCE). Belgium served as the Chair-in-Office of the OSCE in 2006. Belgium sat on the United Nations Security Council during 2007-2008 and served as President of the EU from July 1 to December 31, 2010. The United States and Belgium are good friends and allies, despite occasional disagreements on a limited number of foreign policy issues. Good will and affection for Americans is widely held as a result of the U.S. role during and after the two World Wars, as was exhibited in 2004 during the 60th anniversary commemorations of the Battle of the Bulge and the liberation of Belgium. Annual celebrations of liberation are held in many Belgian communities today. The two nations' continuing cooperative relationship marked its 175th anniversary in 2007. The U.S. appreciates Belgian activism in international affairs, including its participation in the International Security Assistance Force in Afghanistan; its humanitarian, reconstruction, and development assistance to Africa, Iraq, and Afghanistan; its peacekeeping missions in the Balkans and Lebanon; its frequent provision of airlift in international crises; and its hosting of transatlantic dialogues between European foreign ministers and the Secretary of State. As an outward-looking nation, Belgium works closely with the United States bilaterally and in international and regional organizations to encourage economic and political cooperation and assistance to developing countries. Belgium has welcomed hundreds of U.S. firms to its territory, many of which have their European headquarters there. The U.S. Embassy (http://belgium.usembassy.gov/) in Belgium is located at 27 Boulevard du Regent, 1000 Brussels (tel. 02/811-4000, fax 02/811-4500). The European Logistical Support Office (ELSO) is at Noorderlaan 147, Box 12A, 2030 Antwerp (tel. 03/542-4775, fax 03/542-6567). The Consular section in Brussels is located at 25 Boulevard du Regent. The U.S. Mission to NATO (http://nato.usmission.gov/) (USNATO) is at NATO Headquarters, on the Autoroute de Zaventem, 1110 Brussels (tel. 02/724-3111, fax 02/726-5796). The U.S. Mission to the EU (http://useu.usmission.gov/) is located at 15, rue Zinner, 1000 Brussels (tel. 02/811-4100, fax 02/811-4500).